The United Nations International School overlooks the East River in Manhattan. 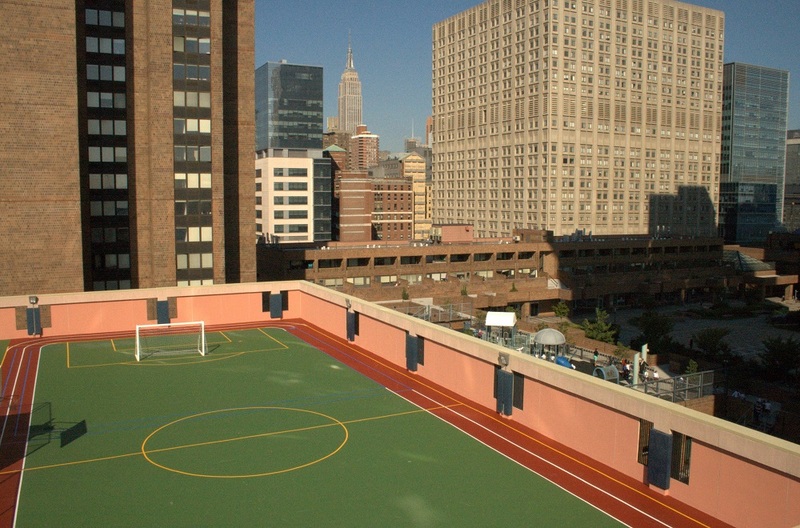 This independent, K-12 school transformed their rooftop into an outdoor recreational area with the help of VersaCoat. This customized VersaCoat sporting system consists of a 4-6mm poured rubber pad with a layer of colored acrylic binding agent. The resulting multi-purpose surface provides an outdoor, rooftop recreational space for students in a densely built city. Students here enjoy playing a variety of sports including basketball, soccer, and hockey. A running track surrounds the perimeter of the recreational area as well. VersaCoat surfaces provide smooth acrylic or polyurethane coatings over concrete and rubber for an endless number of useful and attractive sports and recreation applications. USSA Inc is a division of World Recycling Surfacing Group (WRSG). Please visit our other divisions at www.polyturf.com and www.rubberway.com. USSA Inc is a registered trademark – Copyright © 1999-2019 USSA Inc. All rights reserved.